Located right between Newing and Dickinson, C4 is the go-to spot for Jewish students on campus because of the offerings of its Kosher Korner. The Kosher Korner is overseen by the Orthodox Union and is ideal for students who keep kosher. Along with Kosher Korner, C4 offers a Halal station, and a Simple Servings allergen friendly station. 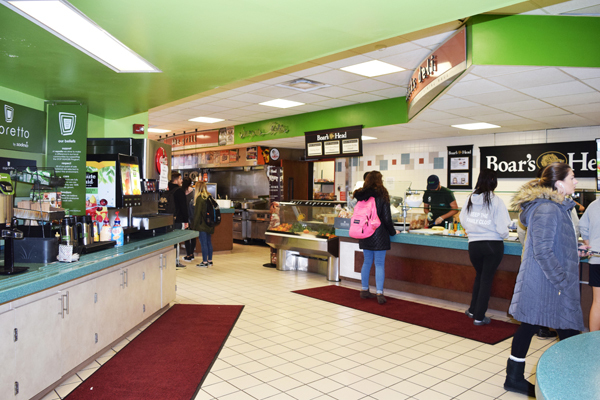 One of the most diverse stations C4 has to offer is its Expeditions Station, which features daily rotating options, including a lo mein bar, and a spot for quesadillas and chicken wings, among other options. 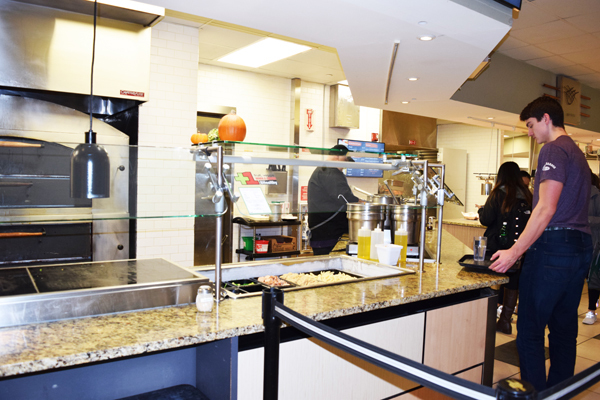 What sets CIW apart from the other dining halls is the BBQ station. Personally, I love getting mac and cheese and corn, because it reminds me of summer. The BBQ station also serves chicken wings and pulled pork daily. In addition to the BBQ station, CIW has partnered with Binghamton Acres and seasonally offers fresh produce at the vegan Gifts from the Garden station. To top it all off, CIW offers its popular Bubble Tea. My favorite thing is when it is warm enough to not dread the long walk up the mountain to Mountainview and App. Being a pasta lover, I loved the pasta bar. Allowing students to pick between whole-wheat and white pasta, and a variety of sauces and cheeses, it’s perfect for any student. App also features freshly squeezed orange juice and the Simple Servings Allergen friendly station, similar to C4. I recommended sitting on the mountain side rather than the dorm side, because the view is great. 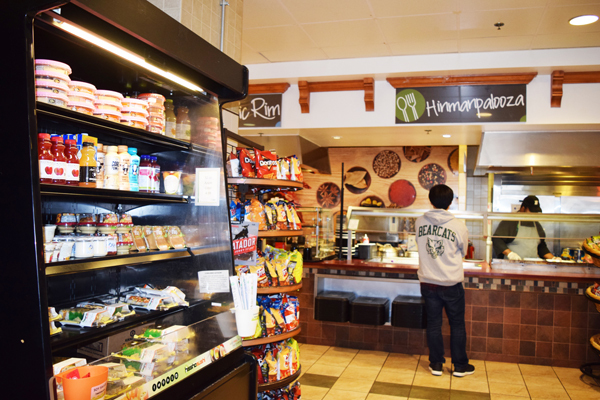 Hinman’s Pacific Rim station is perhaps the most diverse with its Asian cuisine. Pacific Rim always features dumplings, rice and egg rolls. Hinman Palooza is a poplular station, created by the students that usally feature burritos and tacos, making it a great alternative to heading off campus to Moe’s or Chipotle. My favorite thing about Hinman is that it’s located right next to the Lecture Hall, so I never had to trudge 15 minutes through the snow to find food. 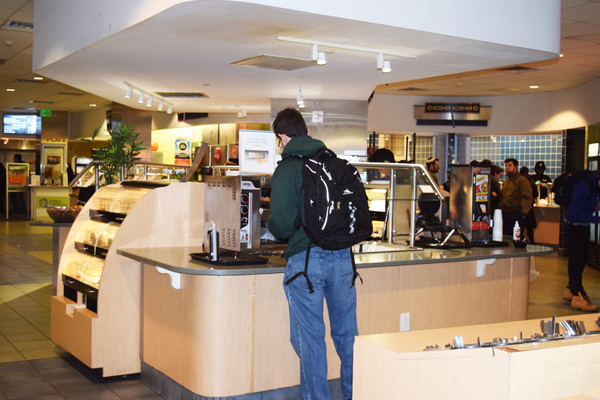 For menus, maps to dining halls and more, go online. Jamie Goerke is an intern in the Office of Media and Public Relations and an undergraduate student in the BA English and Global Culture Program.